Let me start off by saying that I am NOT a very crafty person. Whenever I have tried to do a craft before, it either didn’t come out the way it was supposed to or I gave up because I just couldn’t do it. Yep, you can call me a quitter – or maybe not because I DID try again! The first time I saw a deco mesh wreath was when we went to Walter’s Pumpkin Patch. They had a little store that I thought was the cutest thing. 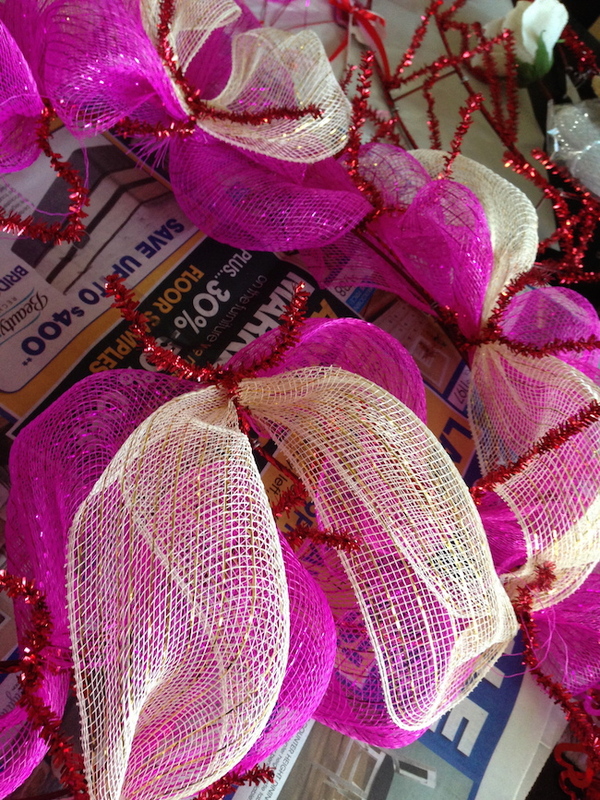 I also thought to myself “wow, that’s a lot of money” for a wreath made of mesh! So, I took some pictures of it so I would remember it and hopefully come across one again and maybe I could figure out how it was made. It was around Christmas time when I had seen a few of the burlap wreaths floating around on some blogs with what seemed like easy instructions. I figured how hard could it be? So, I tried making it – got frustrated and wound up with a mesh wreath that looked nothing like what the bloggers were presenting. At this point I was just absolutely determined to make this happen. After much searching I came across a video that caught my eye because the wreaths were exactly what I was trying to do but the way the crafter was making them was much different. 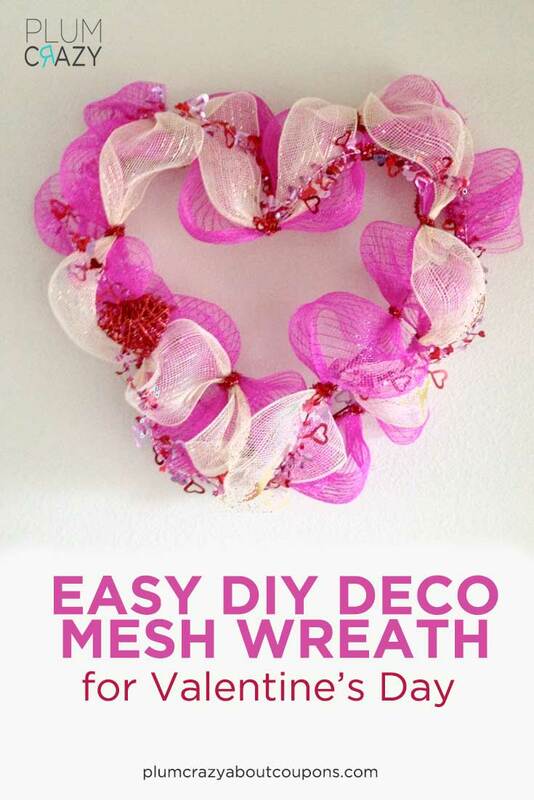 So, below I am going to show you how to make a deco mesh wreath that just about anyone can do with a little patience! 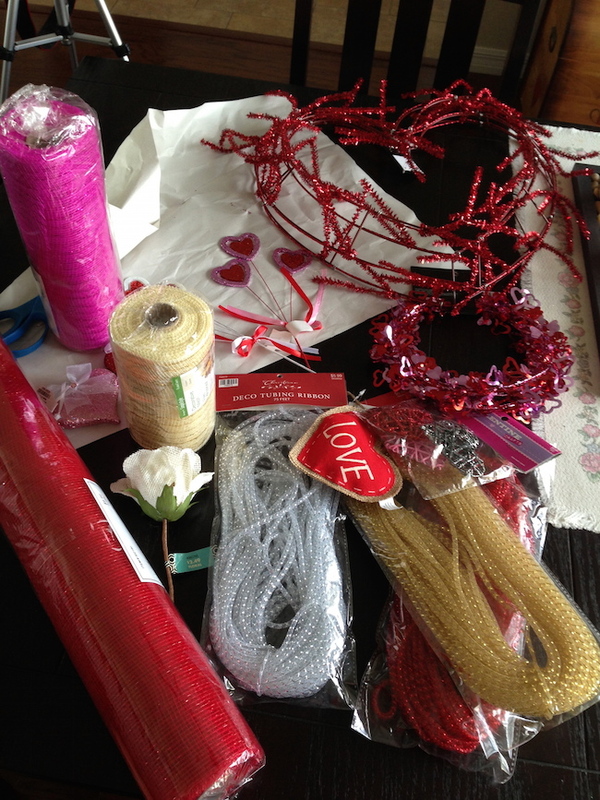 These are supplies for 2 wreaths! I bought supplies for 2 wreaths along with extras because I wasn’t sure what I was going to use. They had some good sales at Hobby Lobby and I got most of the items for a steal! I did not use everything above in the tutorial below though, so I listed only what I used for this specific how to project! 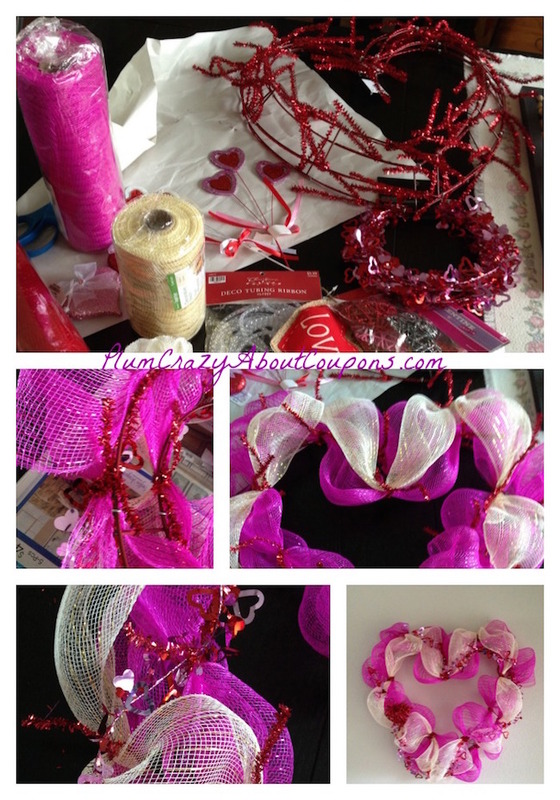 Choose and open the first color mesh you will be working with and gather the end of it and then tie it on the inner part of the wire wreath with the attached pipe cleaner. (If your wire frame does not come with some kind of tie or pipe cleaner, you will need to get these as well). Once your first piece is tied then let a little bit more mesh out and then bunch it together again like you did with the first piece and tie with the pipe cleaner to the inner part of the wire wreath like you did above. Repeat this as you work your way around the wreath. I did my “bunches” of the mesh about 3 inches or so apart. You can rotate top to bottom or do the outside first or the inside first – but whatever you do first you should stick with until you are done! Whatever way you like. I rotated top to bottom at first but didn’t like the way it looked. I took it apart and started over. I did the bottom first then then the top. I also found out that if I had too much space between bunchings, you couldn’t tell it was a heart shape. So make sure you check your work after a few bunchings, there will need to be some trial and error. Add second color randomly. There is no wrong or right way to do it. Add as much or as little as you want. Add whatever extras that you like! Make sure your ties or pipe cleaners are not showing then add some bling! 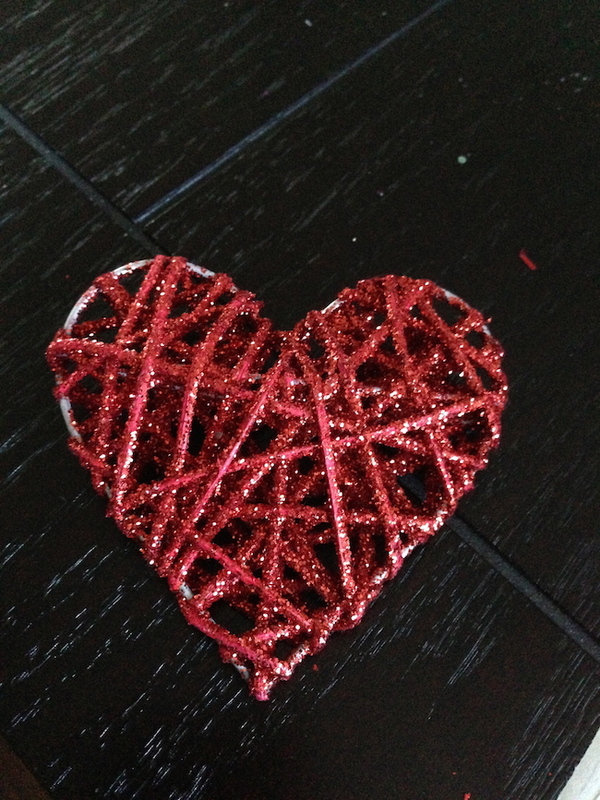 I was able to stick the tinsel right through the heart to attach it. You can also hot glue on any extras that you want. 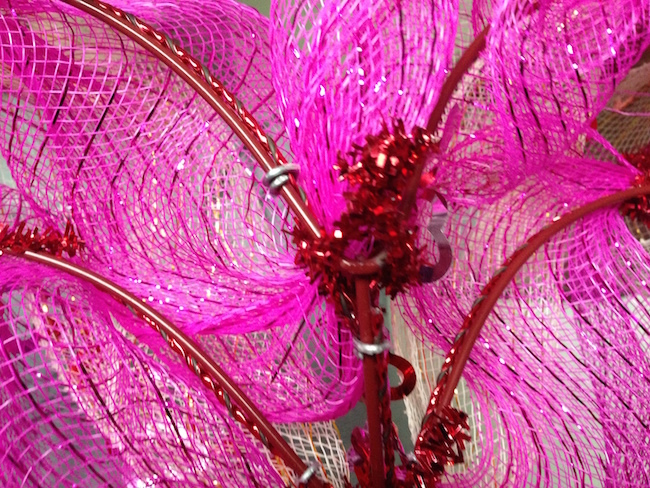 Fold the tinsel behind and flatten against the wire! Make a little loop for it to hang by! I think it came out pretty good for my very first craft EVER, if I do say so myself! 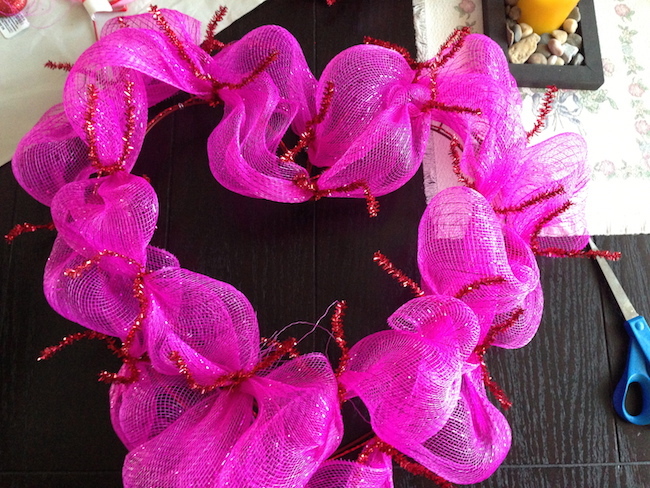 The money I saved was also worth the trouble – the wreath I was eyeing up was $34.99, I think in total the supplies I needed just for this product was under $10 with the sale Hobby Lobby was having and a coupon I had. 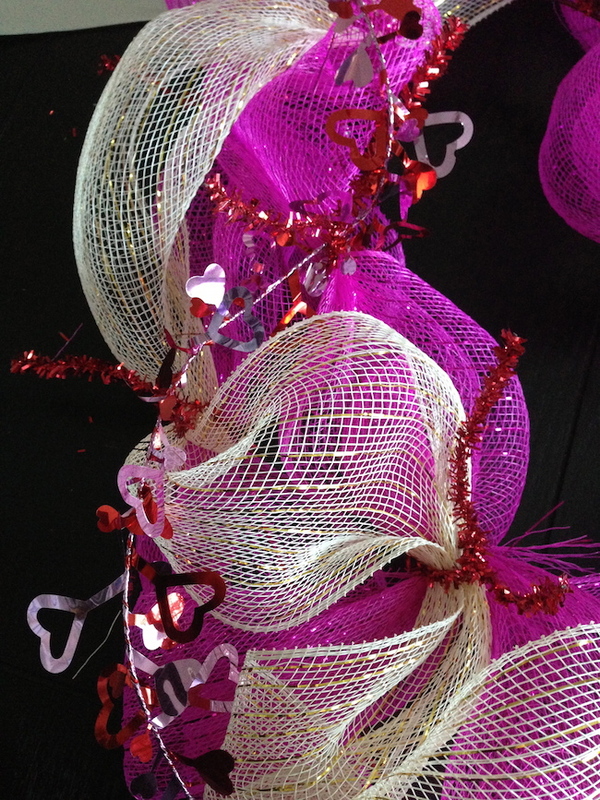 Adorable mesh wreath just for Valentine's Day - but be creative and use this tutorial for any holiday! Choose and open the first color you will be working with and gather the end of the mesh and tie it on the inner part of the mesh to the attached pipe cleaner. (If your wire frame does not come with some kind of tie or pipe cleaner, you will need to get these as well). Create your "bunches" of the mesh about 3 inches or so apart, adjust to your preferred liking. 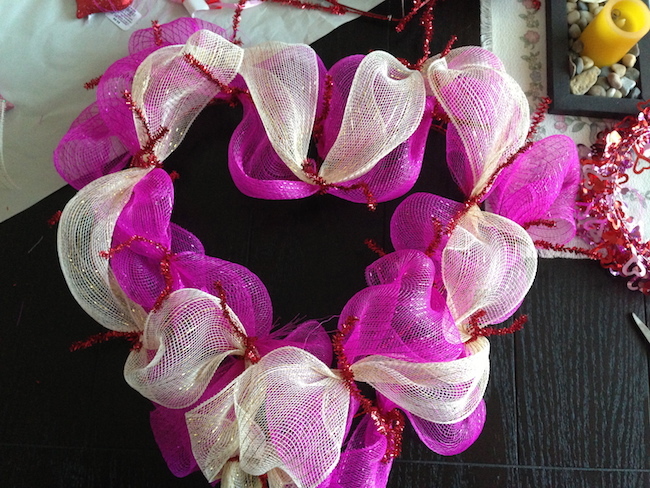 Repeat above with your second mesh color and the outer part of the wire wreath. Ensure all of your pipe cleaners are ties are trimmed or hidden. Be creative with your accents! 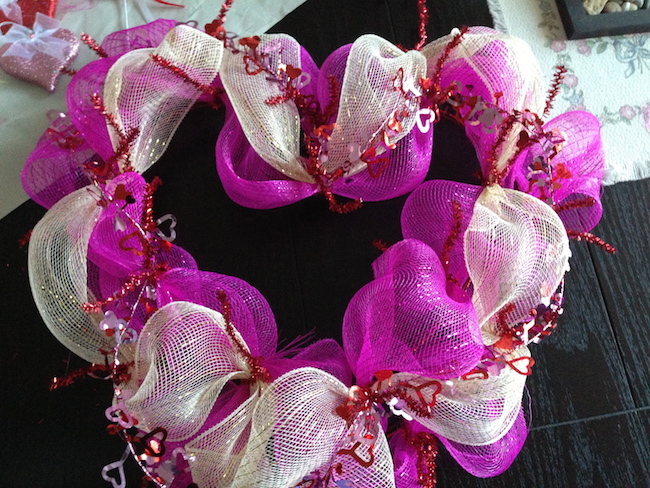 While I only used a string of hearts that I was able to feed throughout the wreath you can also use heart sticks, cupid ornaments and so much more to really make it "yours". Previous Post: « Live Frugally & Still Live Happily! Oh my all stuff from the cheap stores that creates something that looks expensive. Nice! I really like this wreath a lot. 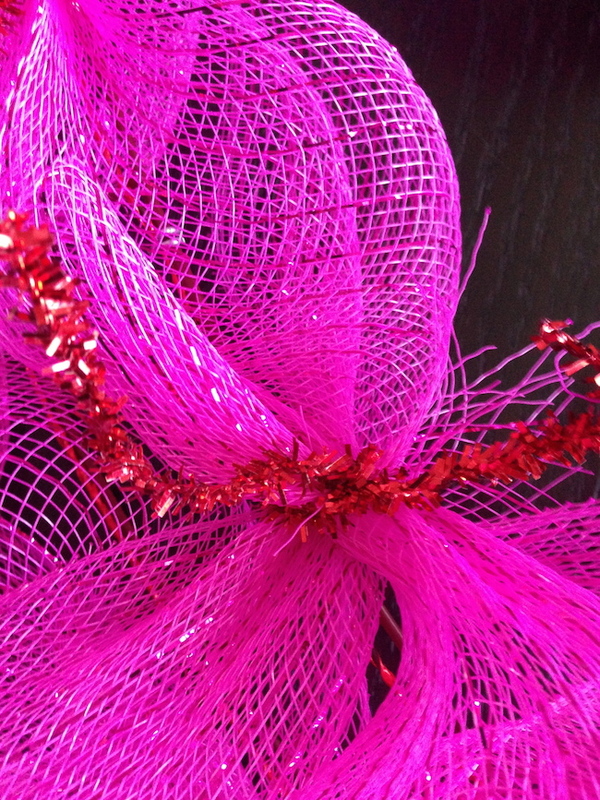 You could use any color ribbon and use it for different holidays too. This is truly a beautiful and fun project, thanks for sharing! I checked out the video and it didn’t seem to take you very long to do! I like things that don’t take hours and hours! This is a lot different than most DIY Valentines projects. Thank you. I would love to have, or try to make one of these. They’re very pretty. This would be a great pre-teen project. what a cute idea for Vday! I’m getting inspired by this craft. I hope that I can do a great job like this. I bet this would be a fun craft to make at a tween party! I bet 11 and 12 years olds would do a great job on this! Out of all of the crafts I’ve seen this has to be my favorite. It’s so feminine and festive looking. You did a great job on the wreath. Thanks for sharing. This wreath is so pretty and I love the colors. I like how the technique can be adapted to any holiday by just switching out the wreath shape and the colors! I love the bright colors. Very perfect for VDay. That is you FIRST craft ever? Oh man, it looks awesome! This isn’t very easy to make. I’m not a crafty person though. Still, I love the bright colors. Especially this time of year when it’s so drab and cold outside. I’ve always wanted to try to make these wreaths, just always thought it would be too complicated. Well, thanks to your video and detailed instructions, I think I’ve got this! Very pretty, by the way, I’ll let you know how mine turns out! This looks fun. I’m not great with crafts, so this looks pretty easy enough, right? You did a great job on this. I really think I might try to make this myself. Have you thought about making these to sell? This wreath is beautiful. And, you make it sound so easy. This is adorable, looks easy to make! What a cute wreath! I love how sparkly it is. Very festive and looks easy enough I may be able to pull it off. My daughter is going to try something like this for Easter. Great idea for my 2 granddaughters (3 & 4) to help me do something crafty on the weekend! This would look great hanging on my sister’s front door for Valentine’s Day because her door is red! I love this but am not a crafty person. I would pay for this. Love that colored mesh! What a cute and fun project. trying to make my wreath tomorrow. I love this and it looks pretty easy! Great for cute decorations. This is so pretty. It is so great how a person can go on the internet and find out how to make about anything. Thanks for sharing. I love the whole thing. The colors are beautiful and so is the finished product. This could also be a really fun gift for teachers for them to put in the classroom or hang on the classroom door! That look s very cute! And like, you, I’m not that good at DIYs. Oh, I can pin all day, but just am scared to try some. This looks pretty easy and very cute. Thanks for sharing! Simple yet elegant. will be back again. I’ve been seeing a lot of this style of wreaths lately. Thanks for sharing! I am not a very crafty person either but I think between me and my daughter we might be able to do this! I still like like this wreath. I wish the daily comments could switch because it’s difficult to come up with a fresh comment daily. I will suggest that. I didn’t realize that was how she set it up. Thank you. This does look really easy to make and the end product is awesome! This would look so fun and festive hanging on anyone’s front door! What a great idea. It would be so easy to use other colors and trim for other holidays too. I bet a 4th of July one would be great. I really like this, my daughter would love this in her room!! Such fun craft to try! I definitely need to give this a shot! Very pretty and so easy. Would make a great center piece or even with a bowl of chocolate in the middle. That Wreath turned out great! what a fun way to be festive. 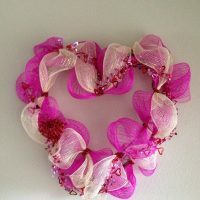 This is a really cool looking ribbon wreath, my daughter would love doing this with me and she’d wanna hang it on her door!! It’s been such a long while since I’ve done any crafting – A pretty wreath like this one will be one of my goals this year. I can’t get over how pretty this just using everyday items. And, if you wanted to buy this at the store it would be expensive. This turned out so well! I made one of these wreaths once and couldn’t quite get the spacing between the “bunchings” even, but you do a really great job! The wreath is gorgeous, I wish I had the patience to make something like this. How cute! 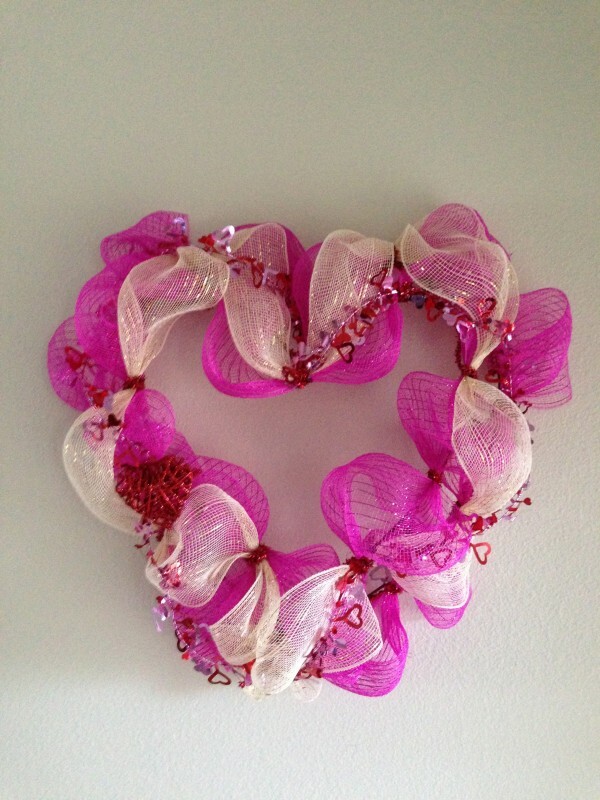 This is a great idea for decorating a girl’s room, too, not just Valentine’s Day. The wreath is really cute I especially love the pop of the fuchsia pink deco mesh against the white mesh and red frame of the wreath. WOw this deco wreath came out great! I love the netting and how simple it is to assemble! this will be a fun weekend craft, thanks for sharing! I’m not very crafty either, but you made this look easy. So cute and perfect for Valentine’s day! I love how this turned out!! Super cute and so easy!!! Thank you!!! I am so surprised how nice it turned out. Thanks for sharing. I love the colors!! Pretty wreath. Looks like even I could do it! This is so cute! My husband would hate this, of course, but I love it! I would love to make some beautiful wreaths for all occasions for my door at school. 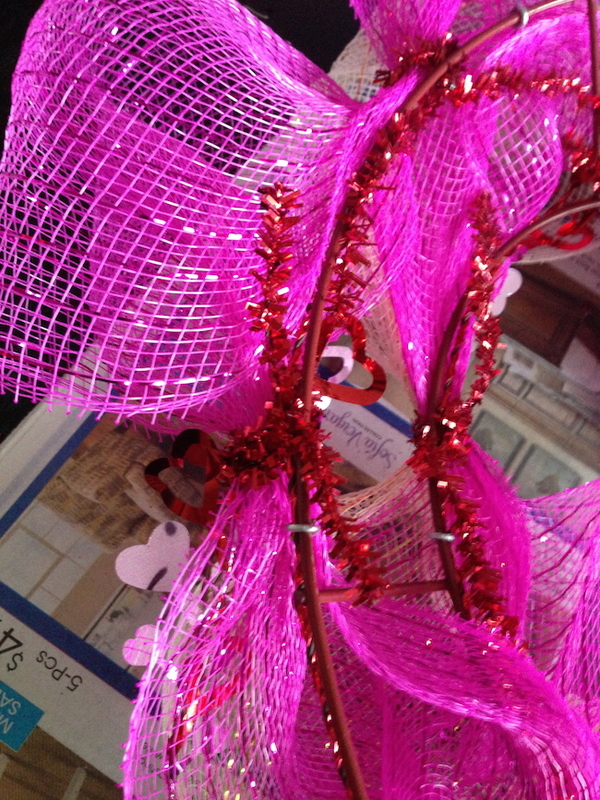 this is a great valentine’s day decoration! I love it! This is so pretty. I pinned it so I can make one. nice and easy wreath idea i believe i could even do this. Very cute and would really cute in a girls room. Great! these decors look awesome and its so creative. its easy to make and can be used as a decoration item for home. That’s very pretty. I don’t know if I’d be able to make it, but I’m going to pin it to try later. Thanks! OMG it looks gorgeous,,, it’s not to hard and looks like fun I know my daughter would enjoy doing this with me as a activity for momma an baby girl!! I’m gonna give it a go myself. Thanks for the tutorial! This turned out beautifully! I can relate to the craft frustration, that part made me laugh. It’s an ongoing experience for me and my failed attempts to make things! Very creative! Too bad I am all thumbs when it comes to crafts. That turned out to be really nice. So crafty, unlike me. This turned out great! Maybe, just maybe I could learn to do this. I am not very crafty either. Thanks! This is adorable, and I think my kids could help me put this together. I think this would be a fun Valentines activity! I adore this wreath and I would love to make my own! Super cute wreath. I’m also not very crafty though. lol. Such an adorable craft to make! It turned out beautiful!